Last changed on 04/23/12. This album contains 34 items. This album has been viewed 4503 times since 03/05/07. This album has been viewed 2609 times since 03/04/07. 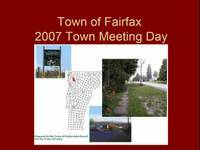 The Town Of Fairfax held its spring household hazardous day on April 26, 2008 from 8 a.m. to 12 noon. This album contains photos of what appears to be one of the busiest ones I have seen since I have been taking photos of them. Created on 04/26/08, last changed on 02/19/09. This album contains 7 items. This album has been viewed 1657 times since 04/26/08. Each year the Fairfax Fire Department holds a Safety Day and today, October 13, 2007 was the day. Photos in this album show several demonstrations given by the Fire Department. Last changed on 10/13/07. This album contains 20 items. This album has been viewed 3576 times since 10/13/07. Last changed on 09/30/07. This album contains 24 items. This album has been viewed 6207 times since 07/14/07.